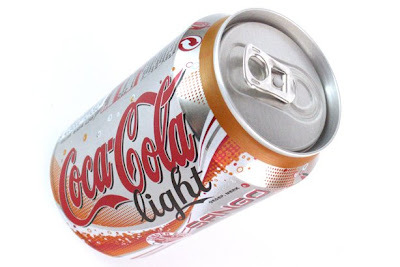 Here is a new taste of Coca Cola Light, this is orange mixed with Coca Cola. Actually the taste isn't really new because when I was little I have mixed Fanta with Cola allot of times. However the orange taste isn't really that strong with Sango, I rather just go mixing up Coca Cola with Fanta though, however you get a bit ugly brownish beverage instead of black. This can of Sango actually come from Belgium which my sister bought it. It's kind of odd seeing that Netherlands actually is almost the last to get new kinds of beverages. The design of the can is the old standard shape and the background main color is polished aluminum. With 4 colors printed on the the can; white, black, orange and red. However I don't like the polished look, it doesn't really look like it fits for this design. The best for the background is that they change to brushed aluminum, which I think will look much better. Also use more lighter fresher color orange because they orange they use is bit on the brownish side. I doubt it's a hit compared to Lime Cola. The taste isn't really special inof or made it better then before, they should either increase the taste or find better mix. Lately Coca Cola light have been allot of new taste added and tested.